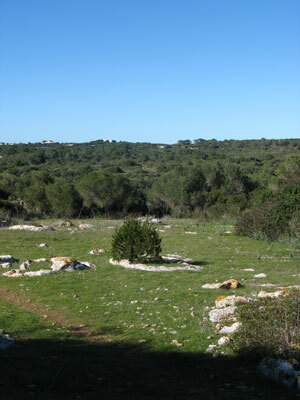 Walks in Menorca, Calan Porter to Es Canutells. Walk from Cala En Porter to Cala Coves to Es Canutells. Use the "+ and -" to zoom the map. Click, hold and drag the map to view surrounding areas. Click on routes and icons for more information. 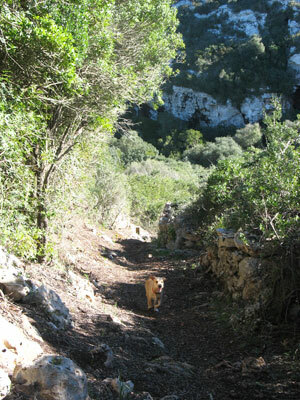 This section of the Cami de Cavalls is not difficult, although the pathways can be uneven and rocky in places. The Cami de Cavalls does not go into Calas Coves, instead cuts off at right angles across the headland. The walk, one way, can be completed in just over one hour, but leave extra time if attempted in the hot summer months. Starting in Calan Porter at the end of 'Carrer D'Alt' near the football ground head east along the very well marked path [Deep Blue in the above map]. The path takes you down into the Barranc, then up the other side climbing steadily, passing through a closed gate it starts to level out. 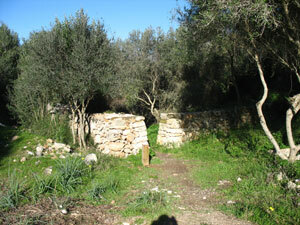 On your left as you reach another iron gate you will see the new wooden 'Cami de Cavalls' gate in the wall. Through this gate the path follows a wall descending slowly at first, but around the next bend it gets steeper as you descend onto the Calas Coves road. Crossing this you turn left and follow the pathway as it snakes it's way up again, steep and rocky in places. The path levels out affording some good views over the Menorcan countryside. Passing through a number of gates until you start the decent into Es Canutells emerging out into the park / play area behind and above the beach. Good walking shoes, sun hat, sun cream, a large bottle of water and, if going down onto Es Canutells beach for a cooling dip a towel and picnic. The round trip including a rest and swim at Es Canutells can be upwards of 3 hours. Through the iron gate for Calas coves, through the wooden gate to follow the Cami de Cavalls. 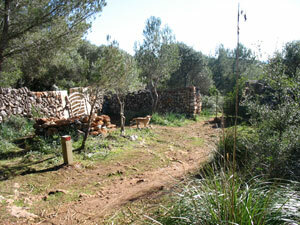 The ending/starting point at Cala Canutells, in the park above the beach. This walk affords some lovely views and photo opportunities of the countryside.